Perfectly match your country inspired bridal shower with our Country Bridal Shower Invite! Our country invitations and recipes cards will warmly inform your guests of all the event details and allow them to share a tasty keepsake recipe. 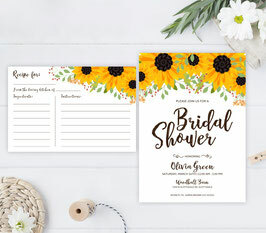 Each card is decorated with delightful yellow sunflowers and printed on white premium card stock.